Seen these names before? I thought not. 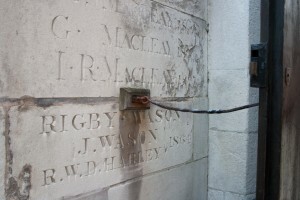 These people have fallen at the first hurdle, the location of one’s inscription. The ones on the right are almost never seen. A better height would be around eye level, neither too high nor too low. Chose a prominent position. 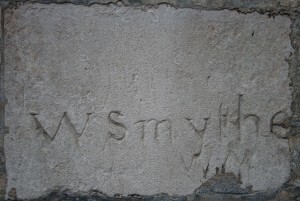 Having a deeply carved, and properly carved, inscription is a key factor of being noticed. The clarity and depth of one’s carving increases the prominence and likelihood of being noticed too. Being noticed for having a poorly done inscription also risks deletion, as has indeed happened in recent years. It is possible to carve well if one has the ability of a stonemason. One might think it is very obvious indeed, and that it is ridiculous that someone might forget to put their name on the wall after inscribing the date. However, as shown by the image on the right, this does happen. 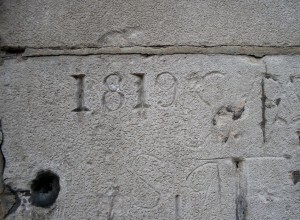 Whilst being pleased with inscribing the date on the wall one must press on with the task at hand. The inscription on the left is one of the best known of them all. However, if one looks carefully one can see that it is in fact G. Legge not Clegge. Using a clear full stop and a small gap avoids confusion. After one has achieved the above one can simply be pleased with oneself. However, do not be lured beforehand to be boastful enough to do your inscription in other language. It makes your inscription completely illegible to the majority of the population who are not scholars in an obscure, old or ambivalent language. By William Kitchen (Ashburnham House). First published in The Elizabethan, 2012.